For this snowflake collection we wanted to make it as magical as the first snow fall of the year. 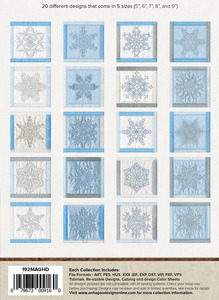 These snowflakes make beautiful pillows and quilts. Keep warm under a beautiful snowflake quilt with a mug of hot chocolate while you watch the real snow swirling outside. 20 different designs that come in 5 sizes (5”, 6”, 7”, 8”, and 9”).